Posted August 16th, 2018 by Crisis Centre & filed under News. 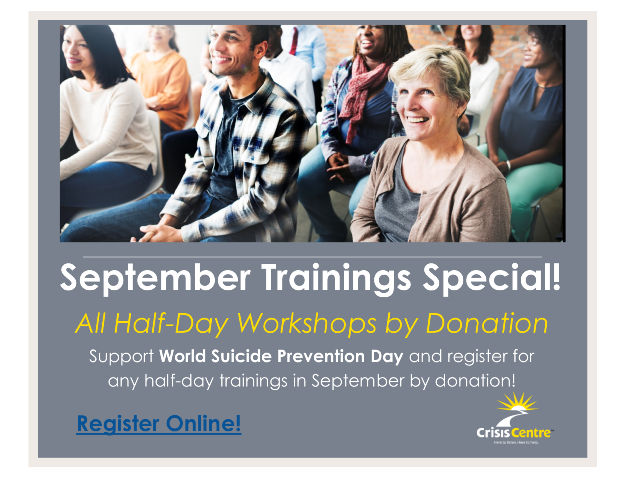 To honour and support World Suicide Prevention Day, register for any half-day trainings in September by donation! Join us, build suicide-safer communities! Gain tools for personal self-care. Learn skills to prevent suicide. Participate in making positive change your community. Register online today! Monday 9:30am to 12:30pm LEARN MORE REGISTER! Wednesday 9:30am to 12:30pm LEARN MORE REGISTER! Friday 9:30am to 1:00pm LEARN MORE REGISTER! Wednesday 9:30am to 1:00pm LEARN MORE REGISTER! Monday 9:00am to 12:30pm LEARN MORE REGISTER!